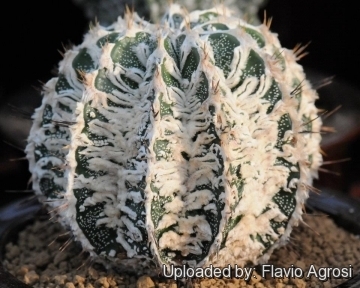 Description: Astrophytum ornatum cv. 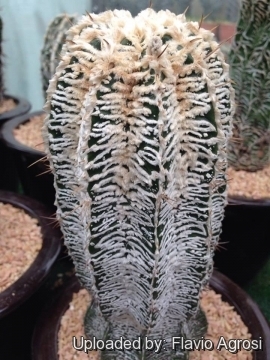 Hukuryu Hania is one of the most beautiful Japanese cultivar with ribs irregularly supplied with raised ridges and white linear, woolly areoles. 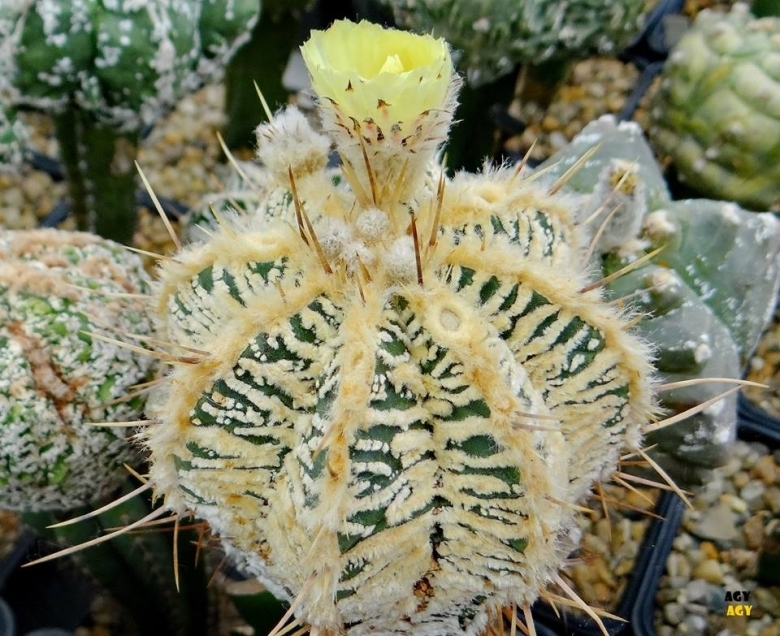 It appears to be a very variable plant especially for the density and distribution of ridges and white scales, with many forms, and has been widely hybridized with other Astrophytum cultivars, giving rise to an infinite range of variation. The whiter and more wrinkled forms are often very pretty and appreciated by collectors. 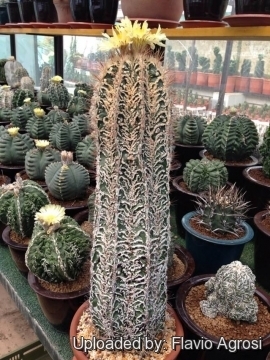 Habit: It is a shortly columnar cactus appearing star-shaped from above. 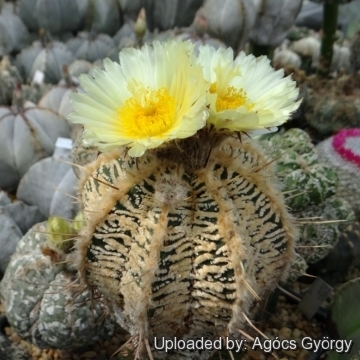 It is the largest and easiest to grow and also the fastest of the Astrophytum. 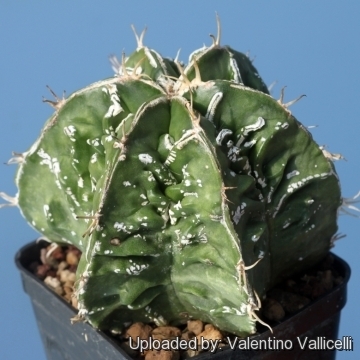 It is also generally more heavily spined than other Astrophytum. Stem: The stem is solitary, globose when young, cylindric with age, 30 to 120 cm (or more) high, 15-30 cm across, greyish-green to dark-green with more or less dense white or yellow woolly flakes in bands forming an ornate pattern. Ribs: It has 5 to 10 (generally 8) straight, rather prominent, strongly compressed, and crenate. Typically the Hania forms has ribs more or less monstrous whit thin, small, extra ribs in the fissure between the true ribs (often with wool and spines) and the surface is wrinkled and covered with white felted ridges. Areoles: 1 to 5 cm apart, yellowish-white felted or woolly with the woolly part often extending between contiguous areoles and forming an almost continuous felt line along the rib. 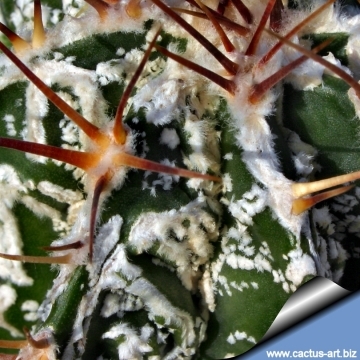 In this felted line are sometime present spines. Radial spines: 5-11 stout, 2-4 cm long usually straight, subulated or ± laterally compressed, amber yellow, later brown and finally grey. Central spine: usually 1 rather larger. Flowers: At apex, large, lemon-yellow 7-12 cm broad. Notes: "Hannya" is the name of a mask used in the traditional “No” theatre that represent the face of a demon with long horns. In the in pantheon of the Japanese demons the length of the horns is in relation to their importance within the group. Hanya demon is often tattooed especially by men because it is a strong and bad character, but they underrate that in reality Hannya is the personification of the demon of the jealousy… and is a woman! Cultivation and Propagation: It grow easily from seed in cultivation. Despite being revered by many collectors, it not too difficult. 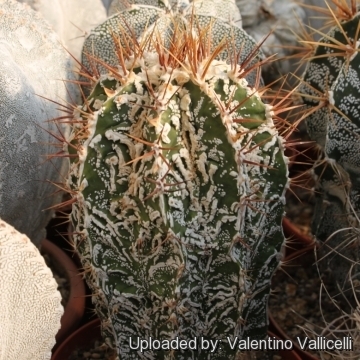 This cactus is pretty cold hardy and can survive to -10° C (if kept dry). It needs to be at least 15 cm tall to bloom . This might take no less than seven to 12 years or more depending on the length of the growing period in the local climatic conditions. Astrophytum ornatum loves a very permeable, coarse mineral soil as well as to be strictly kept dry throughout the winter quiescent period since it is sensitive to moisture excesses. If potted, repot it preferably in the spring, if its roots become cramped. Generally, it should be repotted every other year in order to provide fresh soil. However, this doesn't necessarily mean it will need larger containers. Fill about a quarter of the pot with broken crocks, gravel, etc. to promote good drainage. After repotting, do not water for a week or more. To prevent rottenness it is also advisable to surround its root neck by very rough sand or grit, this help a fast water drainage and an appropriate air circulation. In the rest period no high atmospheric humidity!! Feed with a high potassium fertilizer in summer. 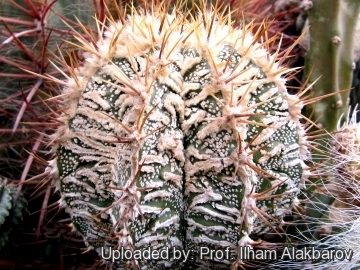 Propagation: They can be propagated easily from seed cutting, grafting.